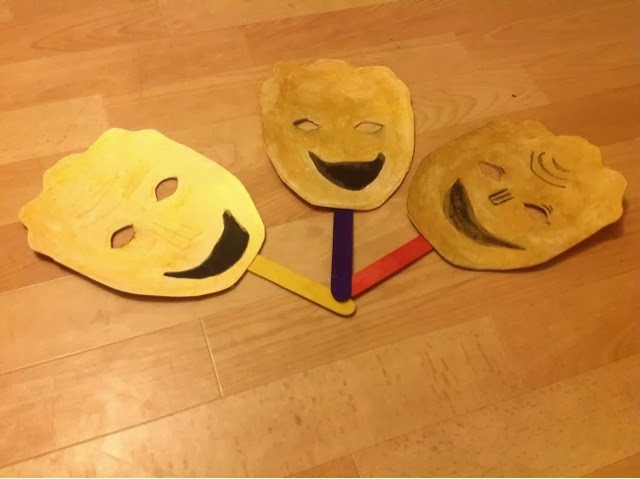 An Ordinary Life : Step by Step how to make an Ancient Greek theatre mask! 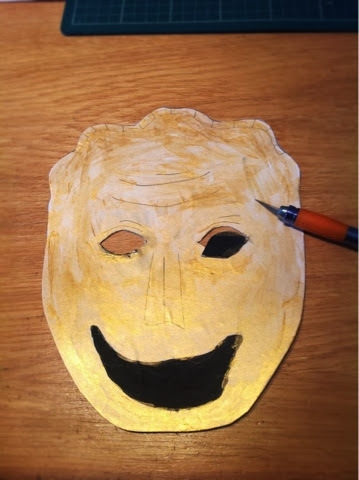 Step by Step how to make an Ancient Greek theatre mask! So we are nearing the end of our Greek Project in our house and today we have been learning all about the Greeks and Theatre! They invented DRAMA ON STAGE over 2000 years ago. How massive their amphitheatres were to fit 14000 people! Anyway, I could go on and on about this as I love learning about history, so instead I have added some more facts at the end of this post for you to read if you, like myself, are also interested! 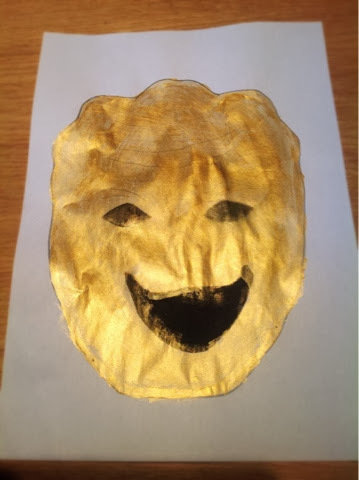 Print out this template: Greek Theatre Mask template or you could try and draw your own if you like. Draw on a Greek theatrical face. The older the man the more facial hair he had, he would also have white hair too. The Greek theatrical masks where very exaggerated so big smiles or huge frowns! Paint your face. My girls chose gold but, as I have already said, there are many colours to choose from. 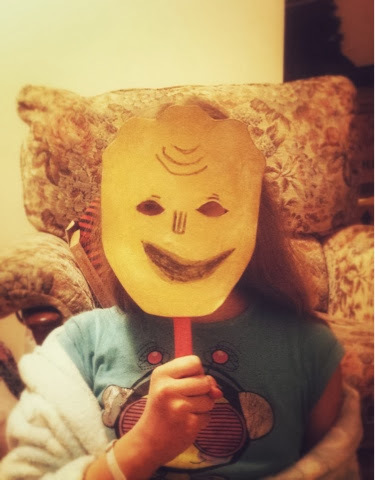 Stick your painted mask to some cardboard - an old cereal box will do. The theatres were so crowded and large that actors couldn't count on people in the back rows seeing their facial expressions as they were such a distance away; hence, masks. How many people were involved in an Ancient Greek theatre production? There were rarely more than a chorus and 3 actors, regardless of how many roles were played. Actors changed their appearance in the skene. Actors needed good projecting voices, but the theatres also had impressive acoustics. The winning Greek choregos (the chorêgos Greek: χορηγός, was a wealthy Athenian citizen) and playwrights were seen has having great importance in society - the Greeks were very competitive. Performances were outdoors often on hillsides with beautiful countryside scenery. The word theatre comes from the Greek word theatron which was the viewing area for the Ancient Greek audience.